William Stiles...Seven judges voted him World Champion. No other Elvis Tribute Artist has worked longer and more often with Elvis's inner circle than William Stiles. Charlie Hodge, who was Elvis's best friend and who lived at Graceland for 17 years, was Elvis’s Stage Manager, sang harmony, played guitar, and gave Elvis his scarves in all of his 2000 sold out shows mentored William for 5 years to provide the most authentic performance of any Elvis Tribute on the planet. When you see William perform you will think Elvis has reentered the building. William Stiles excited our expectations. William Stiles went above and beyond to make sure our event was successful. I highly recommend William Stiles (Stile of Elvis). William was wonderful. We had him for my daughter's wedding and it was so much fun. He went above and beyond what I asked and stayed in touch with me before my event. I would definitely have him again. I recreate an Elvis concert, singing the songs that are recognized as well as the more obscure songs that Elvis sometimes covered in concert. My goal is to be as authentic to Elvis and leave those that have never seen Elvis in person, a feeling of what it must have been like to see him perform live. I use a professional and highly skilled band that have had their own individual successes as musicians to back me up. These musicians have studied the Elvis concert music and are able to reproduce it note for note. They can also perform as an opening act before the Elvis Tribute Show. William Stiles, respected as the #1 Tribute Artist In The World! Charlie's exact statement about William was, "When I first heard William I had to take a step back and listen again. He sounded more like Elvis than any other Elvis Tribute Artist he'd ever heard or worked with. He also has an impressive vocal range." Charlie also performed onstage with William in a Tribute to Elvis at a Legends Theater in Pigeon Forge, TN. While onstage Charlie performed the same duties he did for Elvis in his concerts by singing harmony, playing his guitar, and giving William the scarves to hand to the excited audience. 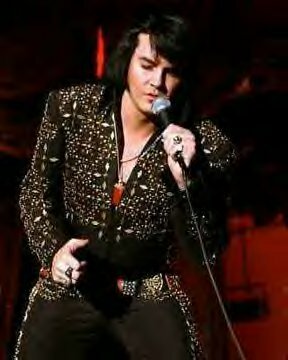 William also appeared on A&E, FOX, CBS, MTV, VH1 and a Documentary movie on Elvis Tribute Artists called "All The Kings Men". He's also appeared on many Elvis related documentaries, tv shows, and even talk shows like The Ricky Lake Show. When CBS Nightly News wanted to feature an Elvis Tribute on their network they flew a crew down to Pigeon Forge where they intervied Charlie and William as well as filming their performance which was also shown on prime time news. Brother actors Matt and Kevin Dillon also researched thousands of Elvis Tribute websites till they landed on William's site. They quickly booked him to perform for a family wedding reception where other celebrities were in attendance. William was also featured three times in or on the cover of regional and national magazines. William is so authentic in his performance to that of Elvis's live performances you will think Elvis has reentered the building. William travels with a four piece band that are professional studio musicians and recording artists themselves. They have all backed famous entertainers as well as different Legends acts. They are also William's show opener providing classic rock, country, blues, and oldies music. WE GUARANTEE: When you close your eyes and listen to William you will swear it is Elvis. He looks remarkably like Elvis on stage. 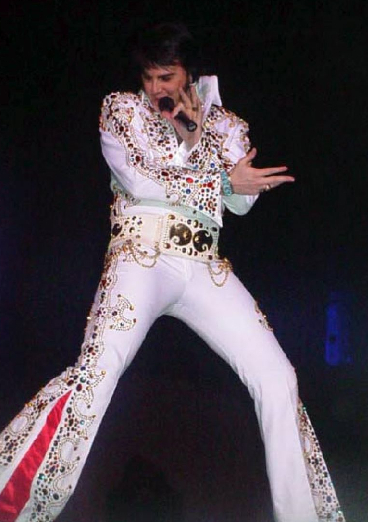 Also like Elvis, he is 6 feet tall, 180 pounds with piercing Blue eyes and reminiscent of the Elvis of the 1970's. He also owns 11 identical Elvis suits made by the same designer that made all of Elvis's suits. There are a lot of tribute artists out there, but if you truly want someone who is recognized, by those who worked and lived with Elvis, as THE BEST, William Stiles is it. We know great talent and William Stiles is simply THE BEST!!!! The booking party is to cover all expenses which will include food, travel, and any lodging. The venue to be performed at or the booking party will be responsible for providing any lighting needed as well as sound equipment. The sound equipment is to have a soundboard, 4 microphones, and up to six monitors. The exact equipment needed can be discussed with my band leader before arrangements are made. We will require a sound check at least several hours before the event which will include a short rehearsal. The band and entertainer will require a secure dressing room with bottled water and a meat tray for 6 people. We will be responsible for bringing band instruments and costumes. We cover all concert concert songs from 1969 to 1977. If there's a particular song that is needed we will learn it for your specific occasion. Elvis, Johnny Cash, Tom Jones, Otis Redding, B.B. King, James Brown, Jimi Hendrix, Conway Twitty, Loretta Lynn, Hank Sr., Willy Nelson, Waylon Jennings, and The Beatles. We also do not provide sound equipment or a sound man.